If you’re near Boston today (Friday) or tomorrow (Saturday), come check out MIT MoSAIC, a traveling festival, currently at the MIT Museum, celebrating Math from the perspectives of art, science, technology, and more. There are panels, presentations, workshops, and of course an extensive Math+Art exhibit from many contributing artists. A few of my recent sculptures will be shown too. Thanks for following along for last month’s Straws Thingy series! I’ll return to give that series a proper debriefing now that I’m no longer wading through its myopic trenches of daily deadlines. 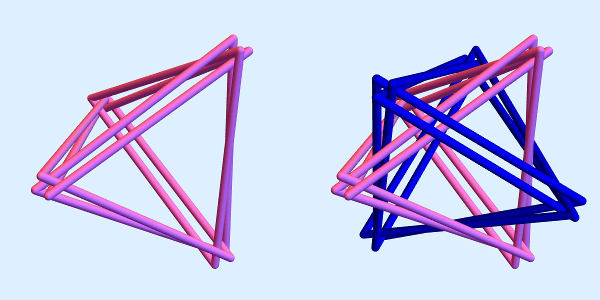 We began describing Straws Thingy’s shape as 5 intersecting tetrahedra, so it is fitting that the two asymmetries we’ve identified so far (color scheme and mirror image) depend only on these tetrahedra. 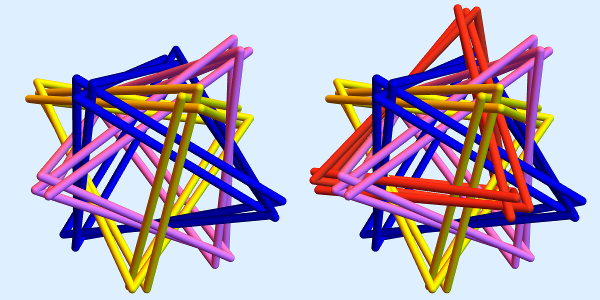 the tetrahedra are in the same locations with the same color scheme, but each tetrahedron is woven differently from its four triangles. Said differently, the spiral at each vertex rotates in the opposite direction. 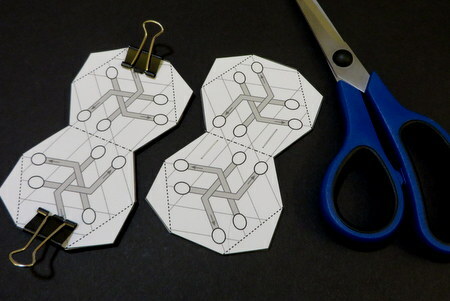 So this interloper occupies a middle ground between original and mirror: each tetrahedron is mirrored in place, but the tetrahedron arrangement isn’t affected. Eight distinct Straws Thingys along 3 binary axes. Left/Right: mirror. Front/Back: color swap. Up/Down: triangle weave. Why are the elbows arranged as they are on the scaffold? What goes wrong if I don’t follow the elbows and weave the corners the other way around? But more fundamentally, nothing goes wrong! I equally could have settled on the other scaffold instead, and I don’t have a strong preference between the two. So we now have 8 different Straws Thingys, all distinguishable, but none especially distinguished from the crowd. BOPGY, BPYGO, BGYOP, BPGOY, BGPYO, BYPGO, BOYPG, BYOGP, BPOYG, BOGYP, BYGPO, and BGOPY. You can check that all 12 of these orderings are different, but remember that any one of them can be used to identify this original Straws Thingy. So if we’re handed a new Straws Thingy and we want to know if it matches the original one, we only need to check a single face of the new one: if it’s in this list, the two Straws Thingys are identical, so the twelve faces of the new one will be exactly these twelve faces. If not, then there can be no face matches at all: the twelve orderings of the new faces can’t be in the above list. So how many orderings aren’t in this list? Well, how many orderings are there in total? We have to start with Blue, but then any of the four remaining colors can come next, then any of the three colors can come after that, then either of the two remaining colors follows, finishing with the only color remaining. So there are \(4\times 3\times 2\times 1 = 4! = 24\) face orderings in total. With 12 of those orderings belonging to the “original” Straws Thingy, there are only 12 other faces to pick from. So any other Straws Thingy, like yesterday’s “odd one out,” has to use exactly the other 12 orderings. In other words, there’s only one other Straws Thingy color arrangement! Any Straws Thingy you build will match either the “original” or the “odd one out”; which did you build? Does this mean we get a third unique color scheme if we swap, say, green and blue instead? How many colorways are possible in total? Let’s investigate this tomorrow. During the next week we’ll prod more deeply into a few features of this sculpture’s symmetries, especially those that become apparent during construction. To begin, a puzzle: all three of these Straws Thingys were built precisely according to the instructions outlined earlier, and yet, they’re not identical arrangements! What differs? This is not meant to be a trick question: their dissimilarity is clearly visible in this image without zooming in or guessing. And in fact, two of these three are identical. Who’s the odd one out? Are there other ways this difference can manifest? Repeat on all the ovals. Next, fold the stacks on the creases as shown: down (mountain fold) in the middle, and up (valley fold) for the four tabs. We can finally undo the stacks with a staple remover (or simply by undoing the binder clips), and our units are complete! Tomorrow we get to assemble them! Straight to work today! Make sure you have printed the template at Actual Size or 100%; don’t let your printer scale it down. Next, form two stacks of 5, and make sure they’re lined up well. Secure with binder clips (left) or a few staples (right). Be careful to avoid the ovals when stapling! Now we can trim the stacks to final shape. Don’t undo the stacks quite yet! They’ll be handy when punching holes and folding creases tomorrow. Hi, guys, let’s keep going! Step 3 comes in two parts: first, ignore Step 2. OK, don’t ignore it completely. The difficulties it raises are real—the arrangement is tricky, and the straws just don’t want to stay put. So here’s my solution to both at once: Scaffolding! To make this project as accessible as possible (without losing the thrill of the build! ), I designed a paper scaffold that helps guide the straws’ arrangement and also helps keep the straws in place during assembly. You can obtain the scaffold template by clicking “Add to Cart” below, for a fair price. Now, about the pricing: First and foremost, I want these plans to remain easily accessible, and therefore available for free (yes, free!). If you aren’t comfortably able to pay for these plans, please don’t—use the free option. Otherwise, a few dollars (or whatever you consider a fair price!) would be greatly appreciated, and would go a long way toward my endeavors to create and share more projects like this. Thank you! Finally, here’s the second half of Step 3: Click “Add to Cart” above to download and print the template. Then, gather the other supplies we’ll need: scissors (or hobby knife), hole puncher, stapler, and staple remover (in case of emergency!). Interlude: What Makes Hard Mode Hard? What makes yesterday’s “Hard Mode” so hard? It’s more than just spacial reasoning. In addition to puzzling out the locations of all the straws, we also need a strategy to keep them where you want them! The images so far have been perhaps a bit misleading. 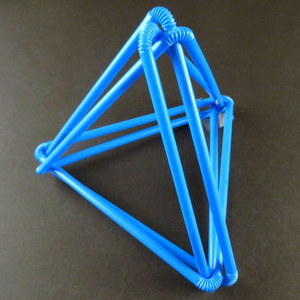 The single tetrahedron I photographed a few days ago? It just doesn’t stay put. Indeed, looking more closely at the static image above, you may notice small pieces of tape in the back corner holding things together. Now you know why. 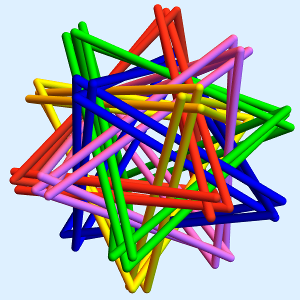 Not until very near the end (about 4 out of 5 tetrahedra) are the straws able to hold each other in place without some form of extra support. So all of you intrepid “Hard Mode” explorers should consider this an amendment to yesterday’s Step 2 (Hard Mode): use some tape, or string, or twist-ties, or dozens of hands to hold things steady as you build. For the rest of us, on to the actual steps tomorrow!